‘Fruit about medium size. Skin yellow, with a greenish tinge on the shaded side and with a tinge of red on the side next the sun; the whole surface strewed with large russet spots. Eye open, set in a rather shallow depression. Stalk three quarters of an inch long, stout, and inserted in a narrow cavity. Flesh yellowish, with a tinge of red, melting and very juicy, sugary, vinous, and richly flavoured, with a high rosewater aroma. A most delicious pear, in use from February till May.’ [Hogg – Fruit Manual p.185/1860]. ‘Several red or rosy-fleshed pears are grown in Europe, but this is the only one described by American pomologists. The tree also, has a marked peculiarity; it thrives amazingly well on the white-thorn as well as on pear and quince stocks. But it is the quality of the fruits that commends the variety most highly. The flesh is buttery, juicy, sweet, and perfumed — pleasing in every character that gratifies the palate. The season is exceedingly variable, and is given by different pomologists from December to March and January to May. The fruits are not very pleasing in appearance, but the accompanying illustration scarcely does them justice in either size or color. 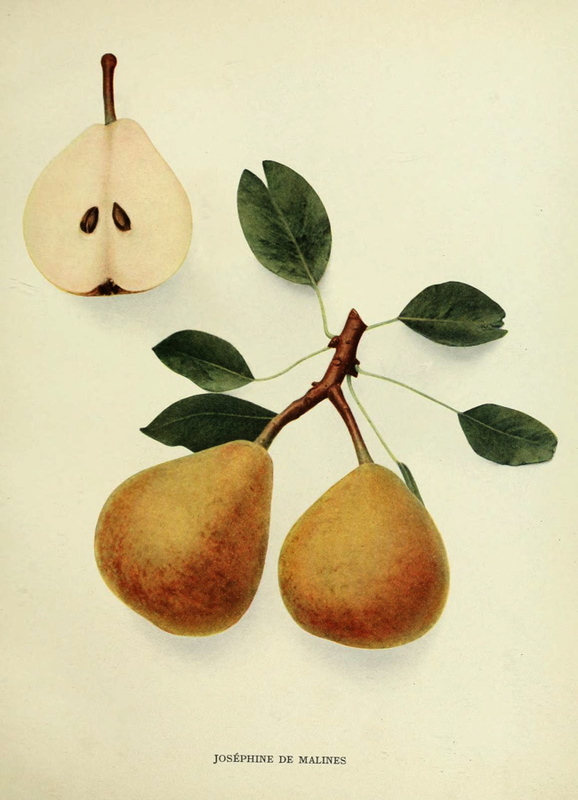 […] This pear originated about 1830 in the seed beds of Major Esperen, the well-known pomologist of Mechlin (Malines), Belgium, who named it Josephine de Malines in honor of his wife. It was introduced in America prior to 1850, and in 1862 was added to the fruit-list of the American Pomological Society, a place it has since retained.’ [Pears of New York p.180]. A hardy tree and an excellent bearer, interesting in that it grafts well to the Whitethorn Crataegus laevigata. A good dessert pear. Available February to May. [HP pl.LXX/1878]. Also figured in Le Jardin Fruitier du Muséum [JFM vol.3/1860]. Listed only in the 1857 catalogue in an Addendum as ‘Josephine de Malines’ [Pear no.61/1857]. ‘61. Melting, first rate.’ [Diary B, MP A2951/1862]. Obtained from Veitch’s Nursery, probably the original Exeter premises.